NB Commentary: But they do know how it came about. they know who created it and why. It was bio-warfare, created in the laboratory. It has killed many in its wake and has filled the coffers of the pharmaceutical companies. It was first experimented on white gay males who had Hepatitis and was believed to cure them of that disease. It did not and instead spread. Once they saw the impact of it spreading they decided to take it to Africa and blame it on the “Green Monkey”. It moved out of the realm of being a disease that only gay males would come down with as straight females, prostitutes, drug users, wives of preachers, political figures and entertainers became infected and died. It became a death sentence for anyone who could not afford the expensive drugs to cure it. Thus many people in impoverished areas of Africa, China, India became infected and lost their lives. HIV is the actual problem. So when folks decided to explore cures for it, and came up with viable immune strengthening programs, they were ostracized, called stupid, and black balled, pardon the pun. I personally know a woman who was curing folks in a hospice with green foods, juicing, fasting, etc. and she even wrote a pamphlet and she was pushed out of her job. There was a Dr. Boyd Graves who went to the UN with his documentation on this infection and he received a horrendous response from the Powers that be who did not want his research to become public. There have been African doctors from the continent who have been silence when they discovered cures. And there has been huge amounts of money made off the suppression of the true information and viable cures of this infection. 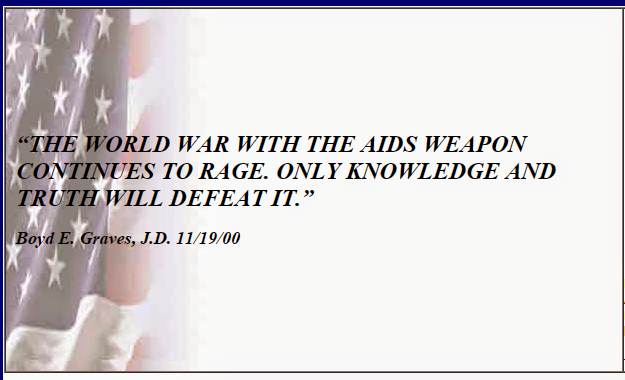 HIV-AIDS was a geopolitical economic ploy of subjugation, manipulation and assassination. I want to watch this video, but after hearing that statement two minutes in, I had to stop it and write my comment. I will continue and I hope that it will redeem itself with more pertinent and factual information. by Boyd E. Graves, J.D. The 1971 AIDS flowchart coordinates over 20,000 scientific papers and fifteen years of progress reports of a secret federal virus development program. The epidemiology of AIDS is an identical match to the “research logic” identified in the five section foldout. 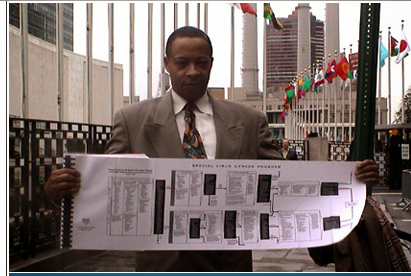 The flowchart is page 61 of Progress Report #8 (1971) of the Special Virus program of the United States of America. We today, challenge world scientists to discussion of this document find. (San Diego, CA) – Human Rights activist and HIV/AIDS advocate American lawyer Dr. Boyd Ed Graves died Thursday at the University of California San Diego Medical Center. Dr. Graves was 57. Dr. Graves’ two decades of human rights’ work, judicial activism and research on behalf of people living with HIV/AIDS, catapulted him into the world spotlight earning him both international acclaim for his bravery and dedication as well as criticisms for his controversial conclusions about the man-made origins and purpose of the HIV/AIDS virus. In 1969 the US government developed a biological agent [ AIDS ] that would have a devastating effect on the human immune system and for which there would be no effective treatment at the time. Military biological warfare research became officially connected to VCP research on October 18, 1971, when President Richard Nixon permanently joined the Army’s biowarfare research laboratory at Fort Detrick, Maryland, with the National Cancer Institute. The army lab was renamed the Frederick Cancer Re-search Center. Scientists in the VCP wanted to learn how to use animal viruses to make cancer – and how to force “normal” human cells to become cancerous by subjecting them to various animal viruses one of which would be HIV/AIDS. A primary task was the large scale production of cancer-causing viruses and suspected cancer viruses to meet research VCP needs on a continuing basis. Special attention was given to primate viruses (the alleged African source of HIV and the KS virus). Another goal was the production of “human candidate viruses.” Candidate viruses were defined as animal or human viruses that might cause AIDS and KS cancer in humans. Biowarfare scientists had a keen interest in animal herpes “helper viruses” / AIDS (1978 VCP Re-port;p 54). Chimps (who purportedly carry the ancestor virus of HIV) were extensively used by the VCP because there would be no official testing of cancer viruses on humans. A 1972 VCP Report (p. 262) emphatically states: “Since man will not be used as an experimental recipient, it is necessary to gain proof of oncogenicity by other means.” How that “proof” would be obtained was never made clear. With its close ties to military biowarfare research it is conceivable that the VCP undertook covert human testing of suspected cancer-causing viruses. The Herald of Provo Utah, February 2, 1992, ran an article on page 1, D1, in which a member of the administrative staff of Brigham Young University by the name of Daryl Tichy has been successfully experimenting with colloidal silver in the treatment of AIDS, along with warts and parvo virus in a dog. “Tichy said he had the material [colloidal silver] tested at two different labs; results showed the solution killed a variety of pathogens, including the HIV virus.” Tichy then states, “I don’t have a doubt in my mind.” He says he has not been able to obtain funds to continue his research. This should not be a surprise, considering what other researchers have been telling us. There is much more evidence to support Tichy’s conclusion. Extensive evidence points to the fact that colloidal silver destroys all types of virus including the AIDS virus and greatly enhances the immune system in general. Colloidal Silver supports the T-cells in their fight against foreign organisms in the blood. It virtually forms a second immune system, actually protecting and defending the T-cells, as well as doing their work for them. It is strongly suggested by research scientists such as Dr. Gary Smith and others that silver ions are essential to the immune system.